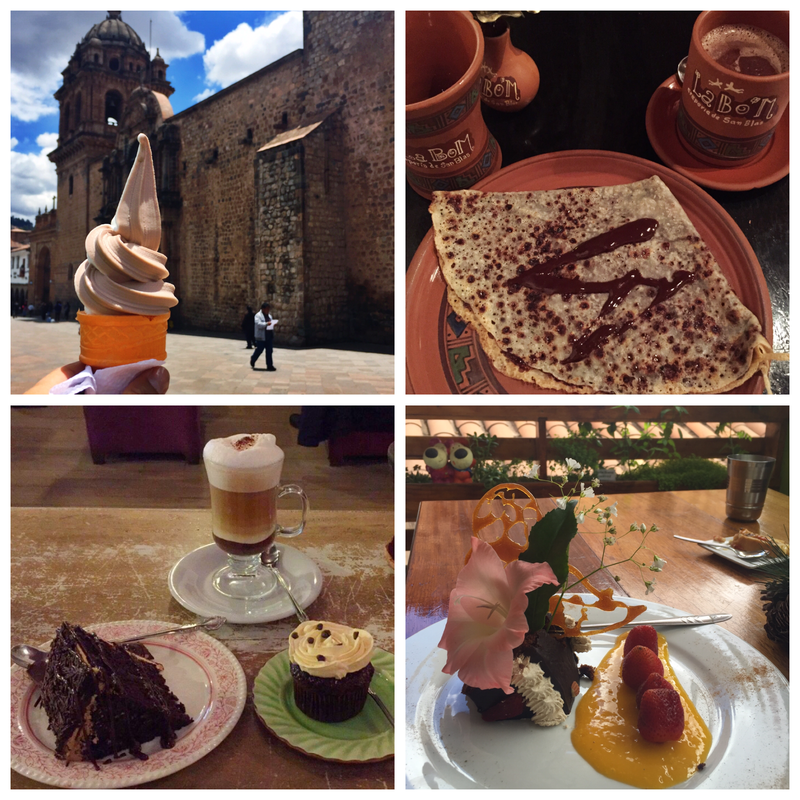 Ok maybe I should be honest and say that it is more than that…It could be due to a lack of sleep, or the altitude, or that I have been craving chocolate and just had the most amazing dark chocolate crepe but I feel like I may not leave this place. I was quite smitten on the plane ride in and the city has only been making me fall harder and it’s only the first night! 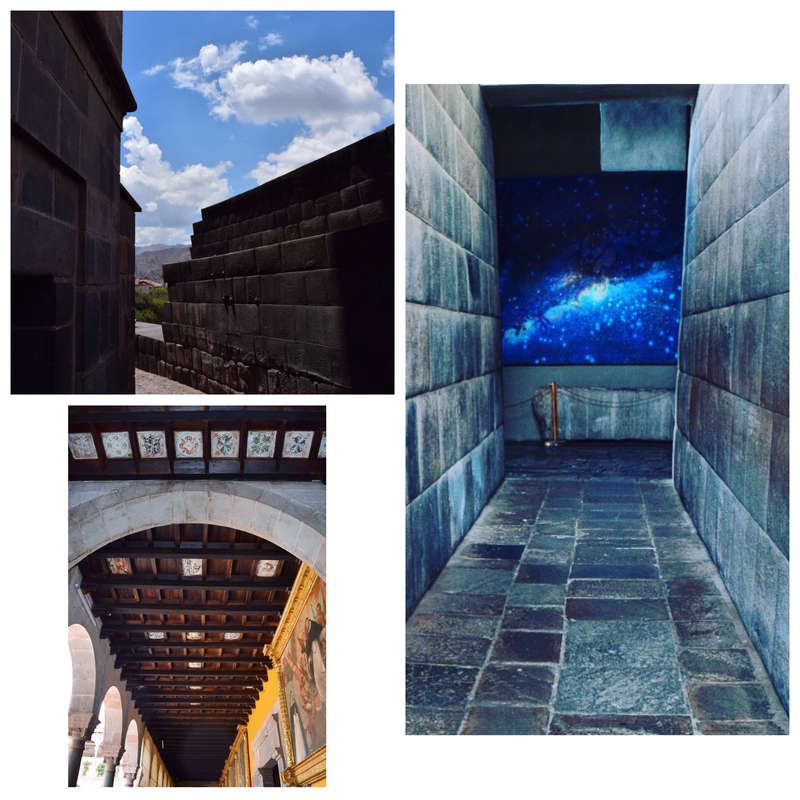 I mean I had an older gentleman walk me to the Ministerio de Cultura – 4 or 5 blocks as he tells me “that it is no problem and I was walking this way” and then as we say our goodbyes, heads in the complete opposite direction! Que bueno! 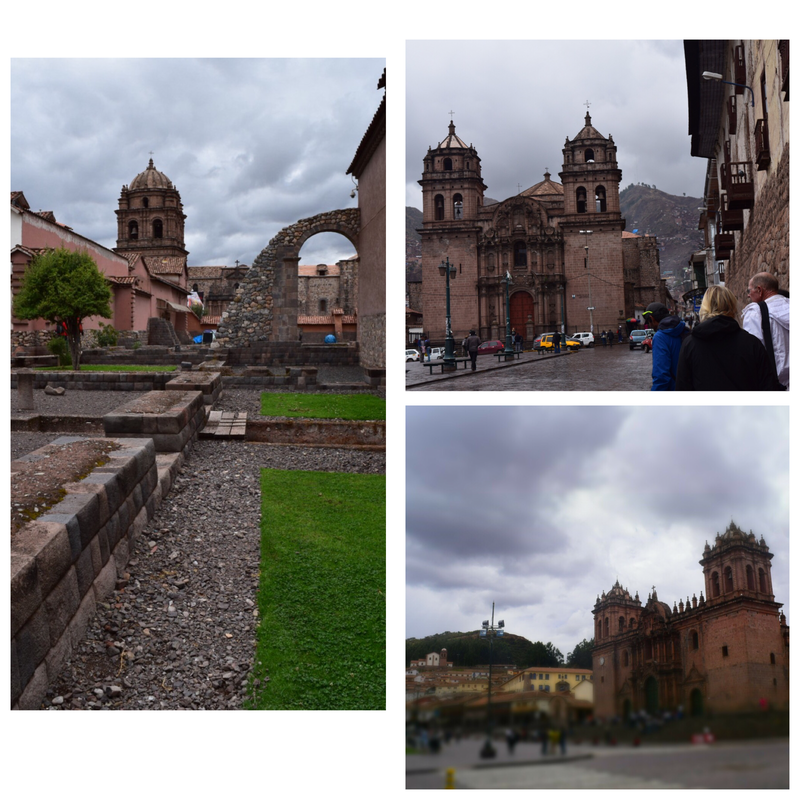 Cusco’s elevation is about 11,200 ft (3,400 M) and luckily I am not suffering from any adverse effects from the altitude. One of my favorite things to do is to sit in the main square get a feel for the city as there is normally a mix of locals and tourists. 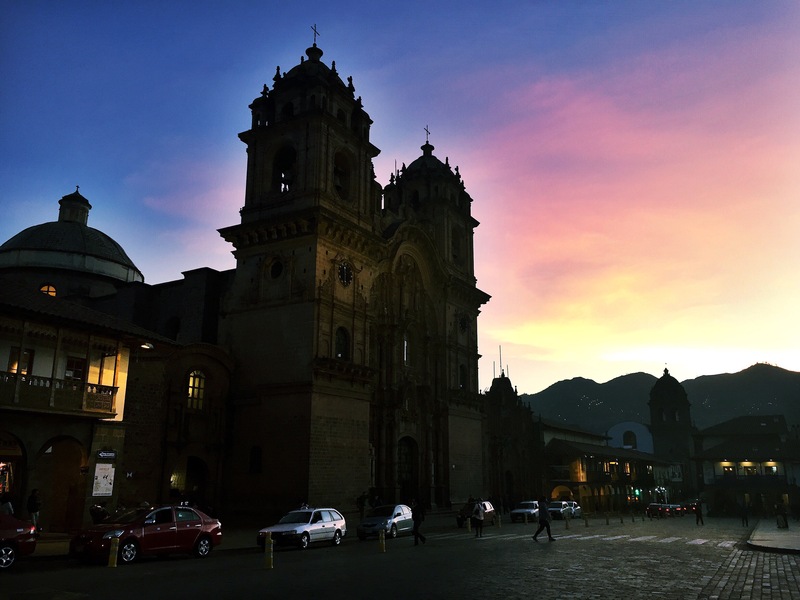 I feel completely safe exploring by myself in Cusco through the early evening into night and really am enjoying the sparkling night lights in the Plaza de Armas. I like to take a walking tour on my first day to learn about the history and to get a sense for a new city. I had befriended some people the night before and we end up joining one of the best tours I would take in South America. The guide was knowledgeable and entertaining and the places that we visited were quite interesting. 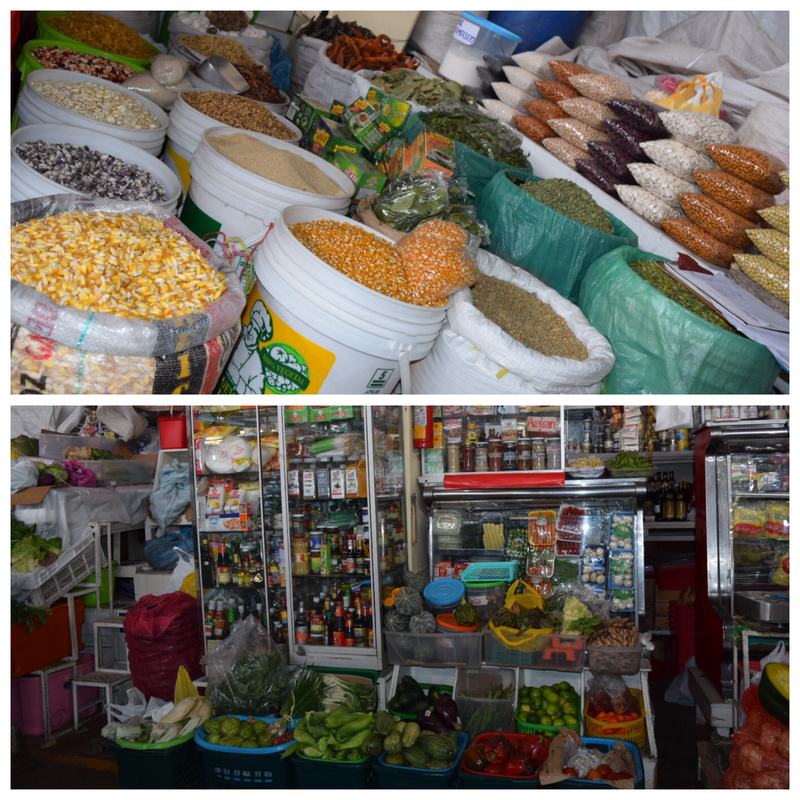 One of the stops is Mercado San Pedro and there is so much to see, experience, and buy there. TL: Entrance to the market TR: Beautiful flowers shops BL: Carniceria AKA meat shop BR: Juice Shops – down an aisle will be multiple purveyors of the same product – which one do you choose? So I was feeling pretty cocky about the altitude not having any effect on me until my Dutch friend and I decided to walk up the stairs to Cristo Blanco. So I didn’t take any photos if that tells you how taxing it was (and didn’t help that we were trying to go as quickly as possible once we realized she had to leave in four hours!) After we finally regained our breaths, they were taken away again from the views – Top: Overlooking Saksaywaman Bottom: Overlooking Cusco Top: Cristo Blanco/White Jesus BL: Another steep way to get to Cusco BR: The stonework at Saksaywaman: so tightly fitted that a sheet of paper won’t fit and combined with inward slope of the walls is believed to be why the ruins have survived devasting earthquakes. 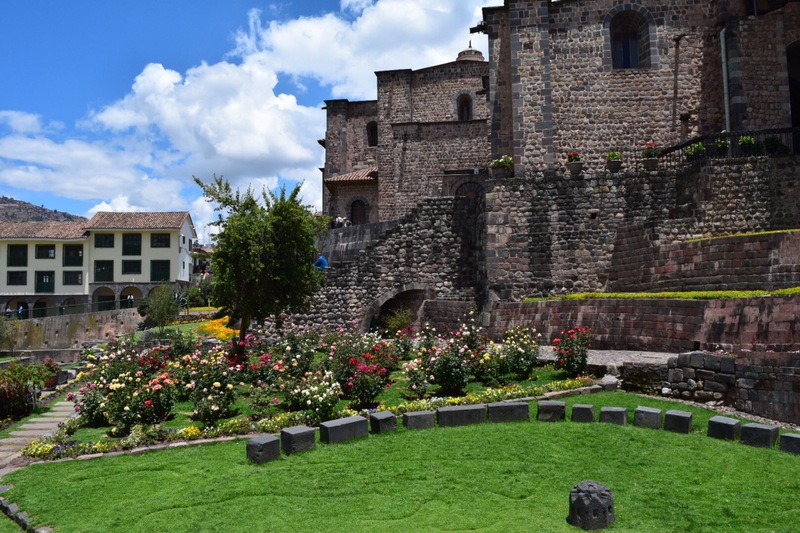 However the Spanish were able to cause a great deal of destruction when they used the stones to build Spanish Cusco and only left the stones too large to be moved. So after a couple of days in the Sacred Valley, I return to Cusco and meet up with my Aussie friend and check out Qoricancha (Temple of the Sun). Translated from the Incan language of Quechua, it means “golden courtyard” as it was literally plated with gold and subsequently looted by the conquistadors. 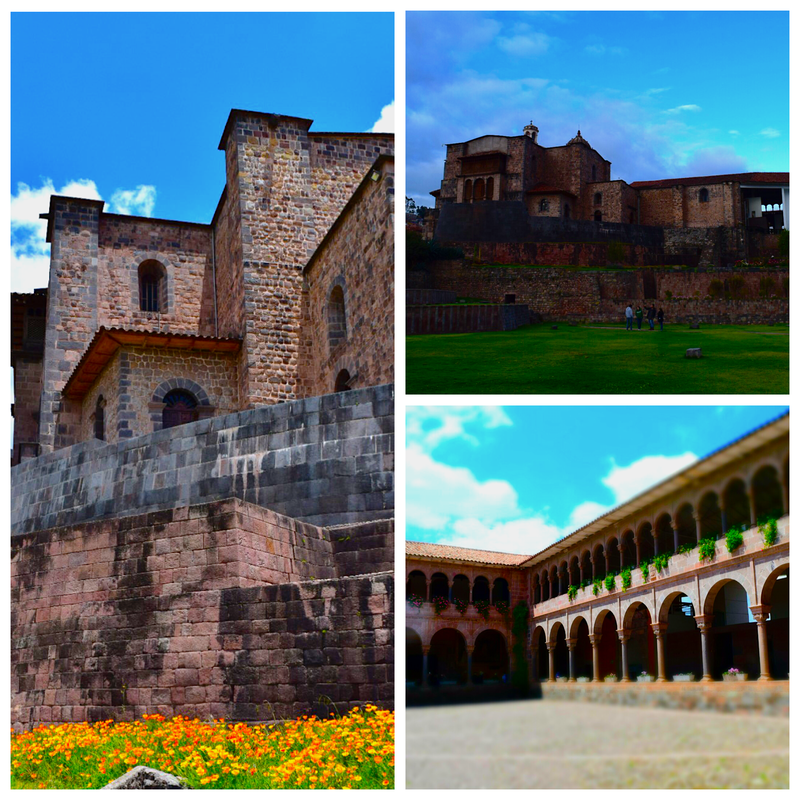 It now is the site of the Convent of Santo Domingo and is a perfect example of the Incan and Spanish history of Cusco. Santo Domigo was built right over the ransacked temple but part of Qoricancha (dark stones still intact and undamaged from earthquakes) remains and is quite visible. 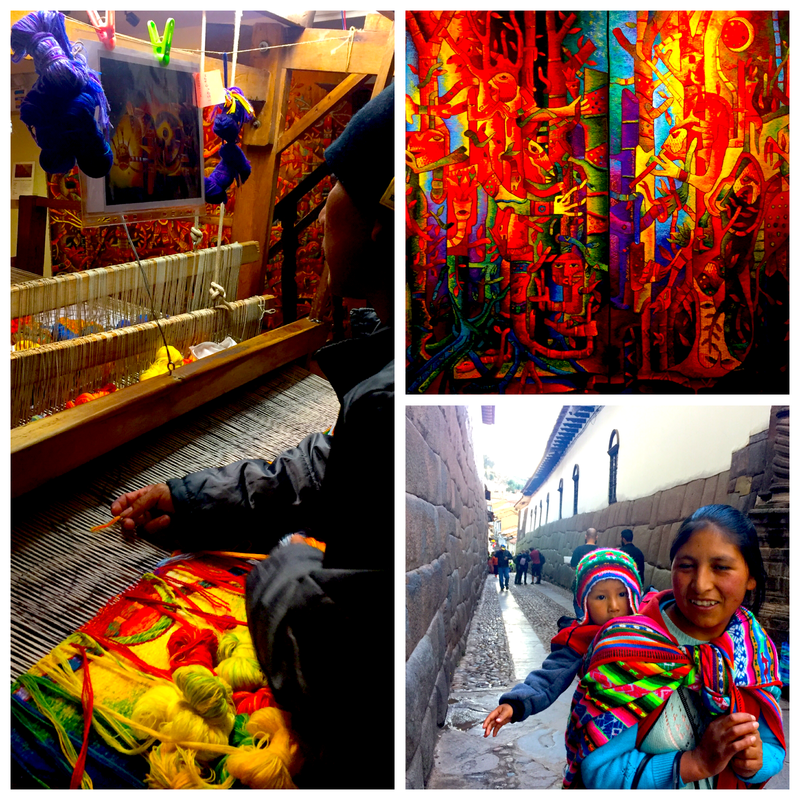 Random things: I end up stumbling into this place after lunch with some friends and discovered these beautiful woven tapestries (top right) and the picture on the left shows how one is made. And of course, the boy is smiling and waving until I pull out my phone to take his picture. Most random of all: I did go and get a massage after MP ~ best massage of my life! And I end up giving relationship advice to the woman (yes: love advice to a person I just met in a language I am not fluent in). 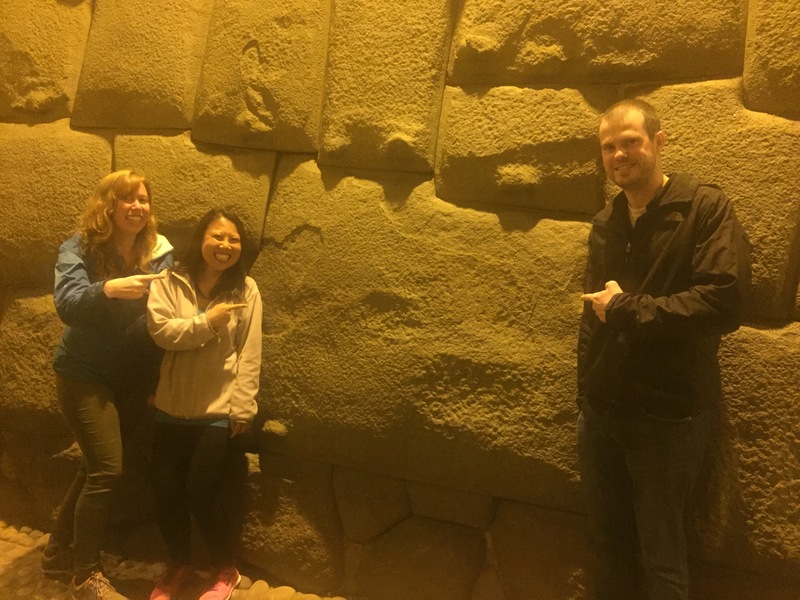 This picture is a good representation of what travel is for me – when you are returning from a night of salsa dancing and decide to take a picture at this rock because every time you pass it, people are taking pictures. It is about meeting and creating connections with incredible people that would be game to ask some random strangers to take our picture and then laugh (rather than get annoyed or mad) when you find out what the fuss is all about. 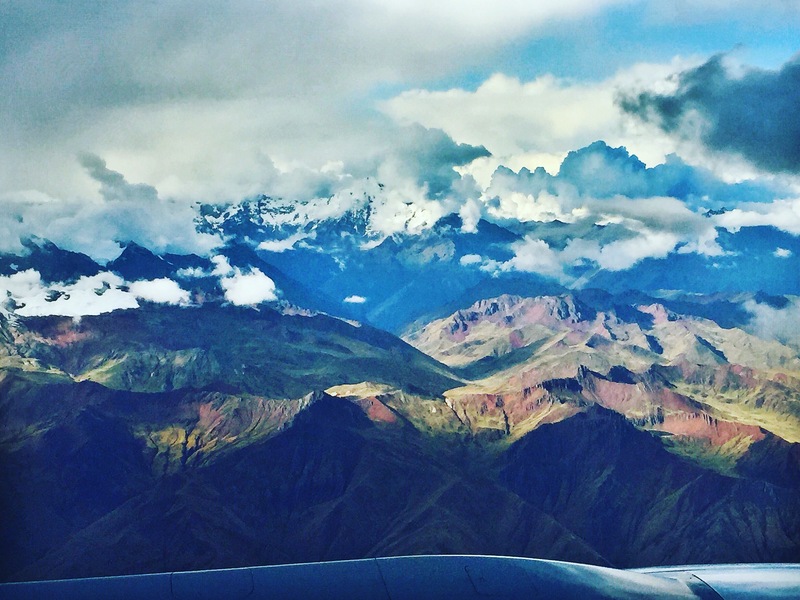 I felt the same way you did when I visited Cusco in 2008 – I felt I could spend a month or more there; it was so easy to feel at home! Check out my blog http://www.amoralegria.com. 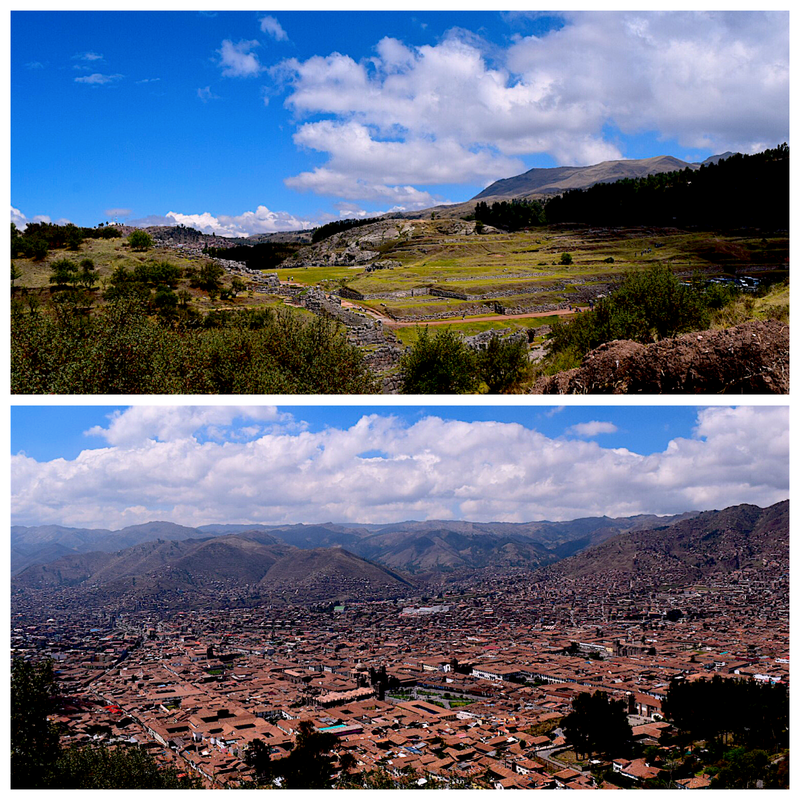 I have several posts on the Sacred Valley, Cusco and Machu Picchu (category: Peru 2008). That trip was amazing! Really was quite the enchanting place and I will check out the blog – thanks!